The other day someone mentioned James Weldon Johnson, and it reminded me of a moment when Johnson's words haunted a major public event. On January 20, 2009, Reverend Joseph Lowery gave the benediction at the inauguration of President Barack Obama. Lowery opened the benediction by reading the words "God of our weary years, God of our silent tears;" he went on to read the entire last stanza of "Lift Every Voice and Sing" by James Weldon Johnson. At the time of Lowery's benediction, few, if any, on-air commentators mentioned that Lowery was reading Johnson's poem/song lyrics, which are widely known as the black national anthem. Not until Lowery presented Johnson's words did I realize how well the song stood up as a poem and benediction. 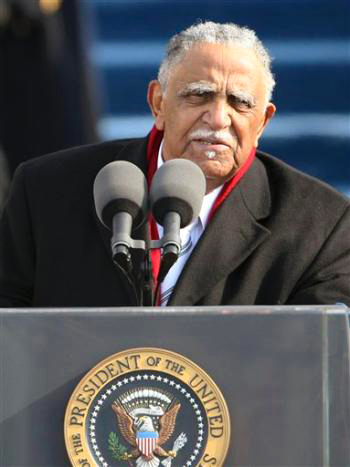 For many African Americans and especially elder black people of Lowery's age, the inauguration ceremony was a most fitting moment to present the black national anthem, even if it was hidden in public view. It says something about the versatility of Johnson's piece that "Lift Every Voice and Sing" could pass as a benediction at the inauguration of Obama. Johnson's poem has a sermonic quality that was useful for Lowery...Reverend Lowery. "Lift Every Voice and Sing" is also written in the first-person plural voice, providing a broad sense of community. Lord, in the memory of all the saints who from their labors rest, and in the joy of a new beginning, we ask you to help us work for that day when black will not be asked to get back, when brown can stick around -- (laughter from audience) -- when yellow will be mellow -- (laughter from audience) -- when the red man can get ahead, man -- (laughter from audience) -- and when white will embrace what is right. Those rhymes at the end were humorous and memorable for attendees and viewers. Notably, the rhymes at the beginning from "Lift Every Voice and Sing" had set a tone that Lowery would embrace aspects of verse in his benediction. Perhaps it's a good thing that the television commentators were unaware that Lowery was presenting the last stanza of the black national anthem in the opening of his benediction. Can you imagine the kind of conservative backlash that would have emerged if some audiences knew what they were listening to? How interesting things would have become if during Lowery's benediction a television commentator had offered the following whispered observation: "and what you're hearing now is a section of 'Lift Every Voice and Sing' also known as the black national anthem." Whatever the case, even without citation, there it was in plain view: the ghosts of Johnson's poem and the African American national anthem proudly haunting the inauguration of the nation's first black president.